DUE TO THE WEATHER, OUR JANUARY MEETING IS CANCELED. WE’LL SEE YOU IN FEBRUARY! It’s after the holiday break and we feel it’s a great time to celebrate our half-way mark of the school year. 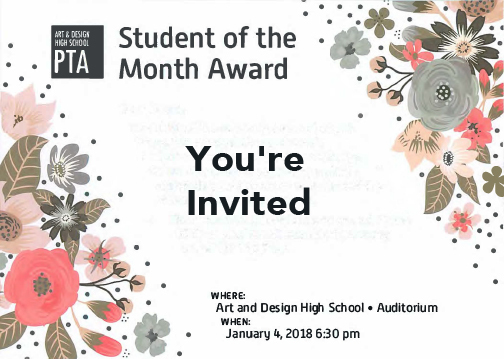 Please join us as we honor past Student of the Month recipients. This is potluck, so please bring a dish! Let’s celebrate! Exec board member and wonder parent Monique Fowler had to resign her position as Assistant Treasurer. We wish her well and thank her for her work! She will stay active in the PTA. Now we need to hold an election for this position at this upcoming PTA meeting. So please come and throw your hat in the ring! Per by laws, the Asst. Treasurer description is: “The Assistant Treasurer shall assist the Treasurer and shall perform the duties in his/her absence.” This role will require approximately 10 hours per month. Attending two mandatory meetings per month, after school. General ledger skills are advised. This meeting will also cover as per regulations, our interim financial report. We will fill you in on how we’re doing budget wise at the mid-way point of the year. This report is then handed to the Principal for filing with the DOE.